Their EMI debut single, Ain’t That Just Like Me , was released in May 1963. The second single was a cover of The Coasters’ Searchin hit. They scored their first British Top 10 hit in early 1964 with a cover of Maurice Williams and the Zodiacs’ Stay . They followed up with Just One Look , Here I Go Again , We’re Through , Yes I Will , I’m Alive and Look Through Any Window . The George Harrison song If I Needed Someone , originally recorded by the Beatles, charted significantly lower in the charts. They returned to the UK Top 10 with I Can’t Let Go and Bus Stop . After even more hits the group attempt to make a more ambitious, less poppy piece with King Midas in Reverse but it only made #18 in the UK charts and this relative failure was a factor in Nash deciding to leave the group. The last original Hollies single of the ’60s to feature Graham Nash was Jennifer Eccles , while Nash’s final sixties Hollies single was Listen to Me , issued in September 1968. Nash left in December 1968 due to a number of issues. Nash was by then feeling something of a prisoner of his early pop success; like John Lennon and George Harrison he too disliked the screaming of fans drowning out the songs in concerts. He felt imprisoned within The Hollies “pop group identity” too, when he wanted to write more personalised songs of a reflective nature not necessarily utilising vocal harmonies. Furthermore, he disagreed with the group’s decision to make their next album composed entirely of Bob Dylan songs. He joined forces with former Buffalo Springfield guitarist Stephen Stills and ex-Byrds singer David Crosby to form one of the first super-groups, Crosby, Stills & Nash. Graham Nash was replaced by guitarist-singer Terry Sylvester, formerly of both The Escorts and The Swinging Blue Jeans. Sylvester proved a capable substitution for Nash as part of the group’s song-writing team. Their next single, I Can’t Tell the Bottom from the Top , again featured the young Elton John on piano. The UK hits continued with Gasoline Alley Bred , while Tony Hicks’ song, Too Young to Be Married became a #1 single in Australia, New Zealand and Malaysia. Allan Clarke’s hard edged rocker, Hey Willy charted in nine countries. Like Graham Nash before him, front-man Allan Clarke by 1971 was growing frustrated, he was eager to do a solo album. Clarke departed from The Hollies in December 1971, a move which surprised both the band’s fans and the public in general. Swedish singer Mikael Rickfors formerly of the group Bamboo was quickly recruited and sang lead on the single The Baby. When Mikael first auditioned for them, he tried to sing in Allan Clarke’s range and the results were terrible. The rest of the group decided it might be better to record songs with him, starting from scratch. Terry Sylvester and Tony Hicks blended with Mikael’s voice instead of forcing him to blend with their original harmonies. There were rumours Mikael couldn’t speak a word of English and had to learn the words of The Baby phonetically. The rumour about him not knowing English was false, however, he did struggle understanding English words he himself had not put together. 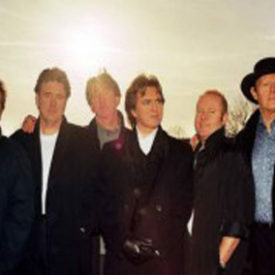 In 1974 they scored what was to be their last major new USA and UK hit single with the Albert Hammond/Mike Hazlewood-composed love song, The Air That I Breathe .The Hollies continued to have worldwide singles chart hits for the rest of the seventies, but notably in Europe and in New Zealand. In 1980 The Hollies returned to the UK charts with the single Soldier’s Song , written and produced by Mike Batt, which was a minor hit in 1980. They also released an album of Buddy Holly covers aptly named Buddy Holly . In 1981, Calvert and Sylvester left the group. The Hollies issued their last Polydor single Take My Love and Run in November 1981 but this failed to chart. They continued to record and tour throughout the mid-1980s. Graham Nash joined them for the recording of an Alan Tarney song Somethin’ Ain’t Right on 10 September 1981 which led to a proper reunion album What Goes Around… in July 1983. The Hollies last hit the US Top 40 with a remake of The Supremes’ Stop in the Name of Love , in 1983. A live album featuring the Clarke-Hicks-Elliott-Nash re-grouping, Reunion, was recorded at Kings Island Amusement Park in Ohio, during a USA tour that followed that same year, finally being issued first in 1997 as Archive Alive , then retitled Reunion (with two extra tracks) in 2004. After its use in a TV beer commercial (for Miller Lite lager) in the summer of 1988, He Ain’t Heavy was reissued in the UK and reached #1, thus establishing a new record for the length of time between chart-topping singles for one artist of 23 years. By this time bassist Ray Stiles, formerly a member of 1970s chart-topping glam rock group Mud, had joined the permanent line-up. 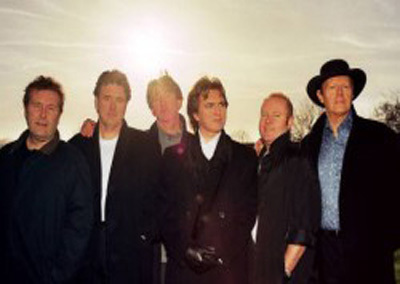 The Hollies were awarded an Ivor Novello Award in 1995 for Outstanding Contribution to British Music. They were inducted into the ‘Vocal Group Hall of Fame’ in the USA in 2006. The Hollies still tour with two original members, Hicks and Elliott. After Clarke announced his retirement in February 2000, he was replaced by Carl Wayne, former lead singer of The Move. A New Zealand Hollies Greatest Hits compilation made #1 in that country in 2001, dislodging The Beatles’ One Collection from the top spot. While re-establishing the band as a touring attraction over 2000 to mid-2004, Carl Wayne, however, only recorded one song with them, How Do I Survive? , the last (and only new) track on the 2003 Greatest Hits (which reached #21 in the UK Album chart). After Wayne’s shock death from cancer in August 2004, he was replaced by Peter Howarth. The Hollies’ first new studio album since 1983, Staying Power , was released in 2006. The group released their new studio album Then, Now, Always , in late March 2009, featuring Peter Howarth on lead vocals.